It is not a quick read but it is an interesting one, through the 735 pages of the life of the well-known evangelist. At times it is more like a modern Marco Polo considering all the well-known people and places Graham has encountered. From the small dairy farm in North Carolina to the palaces of emperors and presidents, this is an unusual story. I did not read the book, however, for the story line. 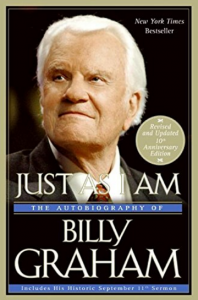 I read it because of the powerful influence Billy Graham has had on the religious world in this century. And, having lived during this time, having read these pages, and having observed many of the controversies surrounding Graham’s ecumenical career, I believe this is a watershed book for those of us who have and do consider ourselves, not just evangelical, but fundamental. Space prohibits me from including numerous quotes from the book. The watershed issue is one of bottom-line ecumenicity: Is there anything beyond the salvation experience (which itself is stretched to thin limits) which compels me to separate from another believer? To Graham there never is, even on important ministry levels. In addition, any person who calls himself Christian, regardless of the theological definition, is a Christian—from the Pope to John Kennedy. The road Graham has gone from being a freshman at a separatist Bible College to where he finds himself at this point, is a slippery slope. When told by the Archbishop of Canterbury, Dr. Michael Ramsey, that he disagreed with Dr. Graham’s theology, Graham answered, “Do we have to part company because we disagree in methods and theology? Isn’t that the purpose of the ecumenical movement, to bring together people of opposing views?” (p. 695). Our generation may not have the stomach for drawing the lines our fathers in the faith did. But somewhere a believer in God’s Word has to embrace truth and shun error even when it is going to cost him dearly. I think that Graham’s denial of a literal hell may well have been a psychological necessity incurred by the growing inclusive nature of his ministry. Some things just won’t fit together in the mind.